A couple of months into its life, and The Wellington’s MakerSpace is finding its feet, getting into gear as a physical product incubator for people testing their ideas. Co-founder Lee Bennett says as businesses around the place learn of its existence, situated at 6 Vivian Street - near its creative Courtenay Place locale- is being approached to produce all sorts of things (See a sticK story on its opening here). “These range from the quirky to the complicated, from restaurants to sports wear manufacturers,” he says. One (slightly ironic given Wellington’s movie making pedigree and the fact that Bennett has worked in the industry) are people wanting something that they’ve seen on-screen. “Some people want movie prop quality, but at a Bunnings price,” he says. “Often we’ll be able to do it, although people should realise that what they’ve seen in a movie might have cost $50,000, but they want it done for a budget of say $800- it's hard to accommodate sometimes” and there’s hopefully a growing understanding that one minute of laser cutting on MakerSpace’s large 1400mm x 900mm CO2 laser cutter/engraver can often require an hour or more's 'consulting and project discussion' before it takes place – it all takes time. As well as such bread and butter income generating business, the other aspect of The Wellington MakerSpace (which also has a 3D CNC router and a 3D printer) that excites Bennett is the development of a making focussed community – one that’s willing to share ideas, willing to help out and many create income streams for the community as a whole. MakerSpace provides a shell where the spark of creativity can be expressed - “It is where people, resources and ideas can come together in a way you don’t necessarily see in everyday life,” Bennett says. It is a place where people can quickly test their newly made products such as jewellery, trinkets and other cool stuff on the public. From there, products can be made and sold worldwide – mostly through the internet via The Wellington Makerspace’s online shopping portal which will also be completed very soon. 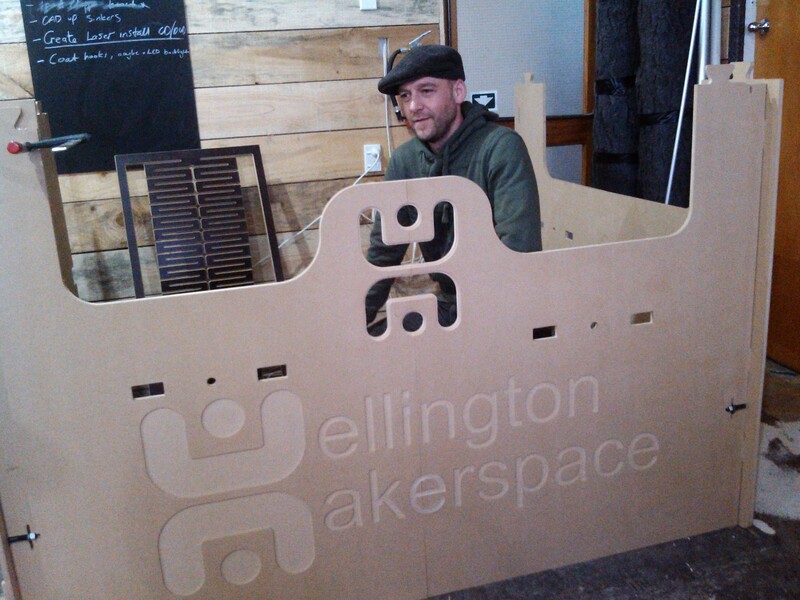 Bennett sees MakerSpace as providing an incubator environment, the success of which will be entirely separate from The Wellington Makerspace, as new creative physical businesses branch off and grow from ideas created within the Space. Along the way MakerSpace is also teaching people new skills -or renovating some old one's -making people aware that they can actually design, create and make things themselves - not only consuming what the market offers. As well as offering it's own Wednesday evening “intro to using the digital equipment”-type courses, The Wellington Makerspace has teamed up with another newly formed and Wellington Home Grown enterprise – Chalkle.com and together they now offer a whole gambit of creative and learning workshops. An extremely popular series of courses introduced to adventurous Wellingtonians is themed around an impending ‘Zombie Apocalypse’, and includes survival weapon-making especially Longbows, crossbows and PVC Pipeguns - demand for the sessions has leapt and they now have long waiting lists for many weeks in advance. Checkout here for details. He considers that part of MakerSpace’s attraction “is for oddballs like me.” This is particularly for people who possibly 'don’t quite fit', but who are creative and are looking for an outlet and place to express that. Bennett’s also keen to work with schools - particularly the lower decile ones and be able to provide positive experiences for what he terms the “rough diamond” kids in particular. Original generation time 1.3857 seconds. Cache Loaded in: 0.0936 seconds.